The video below demonstrates a side-by-side comparison between an existing 2-color pyrometer and two Williamson Dual-Wavelength Pyrometers. Williamson Dual-Wavelength pyrometers are 20 times less sensitive to scale due to greater separation between wavelengths, when compared with 2-color pyrometers. Two-color sensors are an appropriate choice for many common temperature measurement applications. However, when certain conditions are present such as water, steam, scale, severe temperature gradients, severe or intermittent optical obstruction, flames, combustion gasses, laser energy, plasma, small targets and low temperatures, or when real-time emissivity measurements, measurement condition validation, or calibration stability are required, dual-wavelength pyrometers are a more appropriate choice. 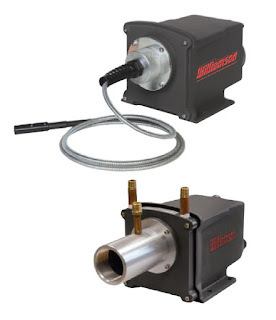 For more information on non-contact temperature measurement or Williams infrared pyrometers visit https://hilealabama.com or call 800-536-0269.